Unique Moments Photography offers "Day After Sessions" for our clients. The more crazy and uniqueness of a location is even better. If there is Hiking involved then count us in. One of our favorite things to do is to go out with our couples and create unique Compelling Images. 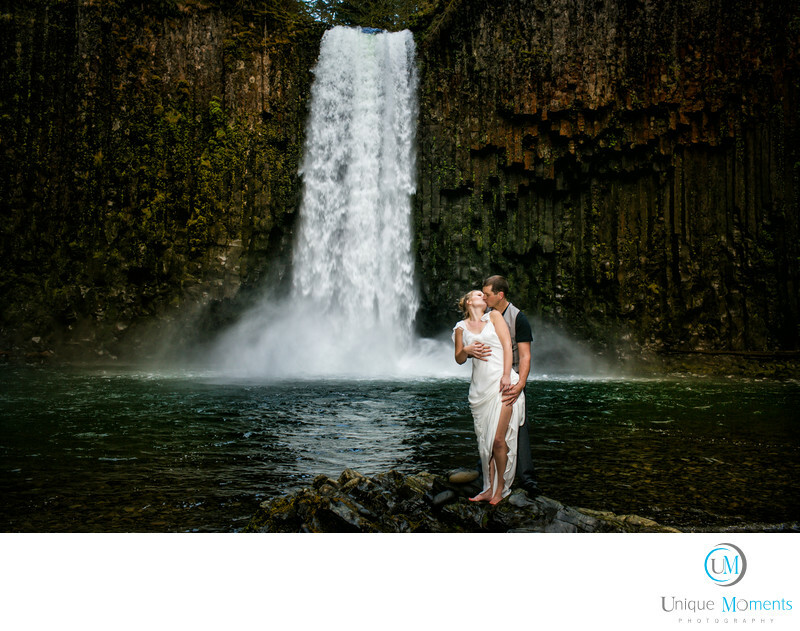 Obviously, you cant drive from Gig Harbor to Abiqua Falls in Oregon for a bridal portrait on your wedding. And, you are not going to climb down a mountain terrain and pull yourself back up with ropes in a bridal dress. Plus I have to back pack in 30-40 lbs of gear and lighting to capture an image like this. That being said. This style of photography is my favorite thing to do. If you have a place in mind, and you really want to create something truly Unique, then the Pacific northwest is your oyster for this style of photography. Its a win win for everyone involved. I get to use the images for print comps and our clients get to hang an art piece on their walls that is unique to them that No one else can replicate. I never say no and its fun for everyone involved.